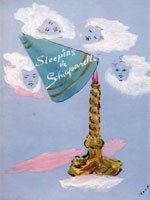 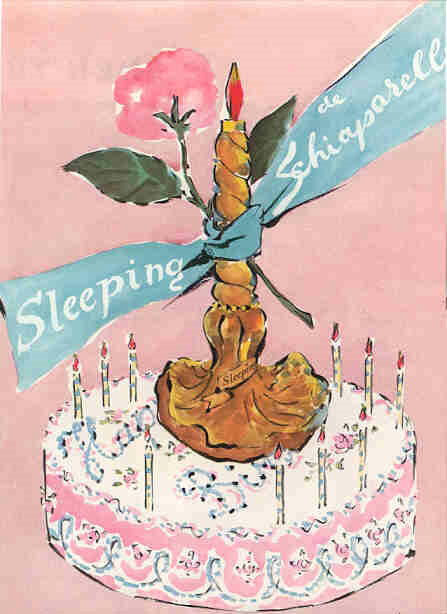 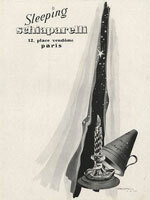 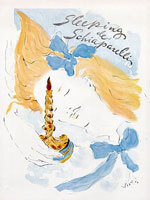 Perfume and fragrance advertisements for Sleeping by Elsa Schiaparelli. 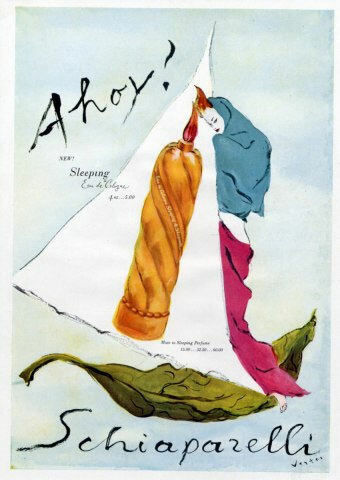 Sleeping by Elsa Schiaparelli - This heavy sweet fragrance, launched in 1939, was presented in a candle-shaped bottle designed by Salvador Dali, prominent Spanish surrealist painter (1904-1989). The flacon was created by Cristalleries de Baccarat. 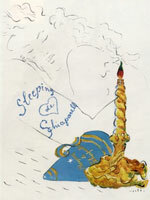 Dilys Blum, author of "Shocking! 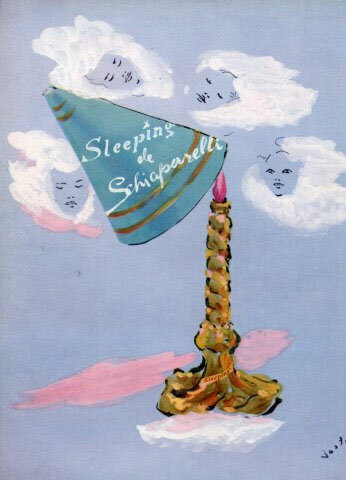 The Art and Fashion of Elsa Schiaparelli" indicates that the Sleeping perfume bottle resembles the harlequin's head in Man Ray's "Le Beaux Temps" (1939) painting. 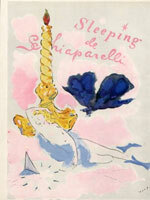 Schiaparelli, further inspired by the painting, also created a patchwork harlequin coat. The turquoise blue packaging color, called Sleeping Blue, was a predominant color in Schiaparelli's 1940 Summer collection. 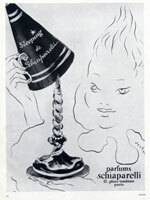 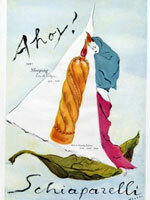 Advertisements were created by French fashion illustrator Marcel Vertes. 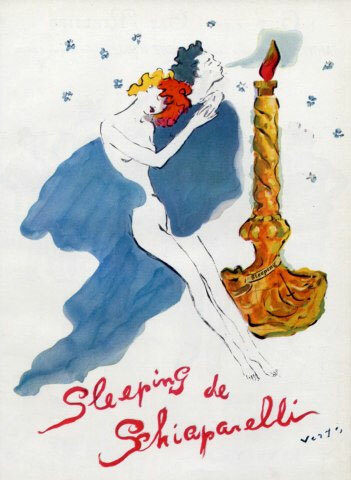 According to Vertes, the scent of Sleeping was designed to "illuminate the subconscious and light the way to ecstasy." Sleeping de Schiaparelli was intended as a night-time fragrance, which one would spritz before falling into bed, also keeping with her fondness of surrealist artists and their obsession with dreams. 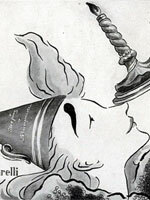 Perfume advertisements for Sleeping by Elsa Schiaparelli by fashion illustrator, Marcel Vertes. 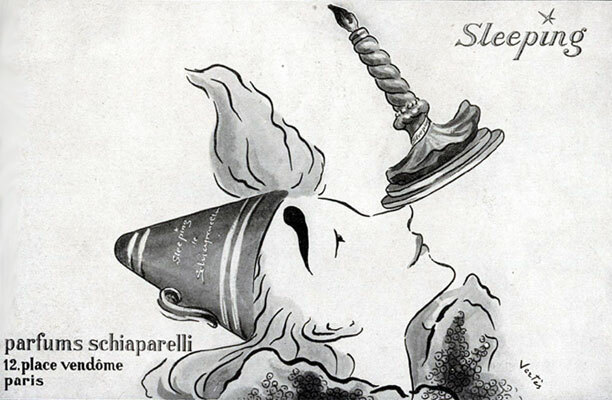 Perfume advertisements for Sleeping by Elsa Schiaparelli by illustrator and painter, Robert Falcucci (1900-1989).